(CNN) – Republican Sen. Pat Toomey of Pennsylvania blamed political polarization for the failure of last month's background check compromise he reached with Democratic Sen. Joe Manchin, saying some in his party simply voted against the measure to prevent the president from winning a legislative victory. "In the end, it didn't pass because we're so politicized. There were some on my side who did not want to be seen helping the president do something he wanted to get done, just because the president wanted to do it," Toomey said. "The toughest thing to do in politics is to do the right thing when your supporters think the right thing is something else," he added. His comments came in an interview Tuesday with a roundtable of Digital First Media editors in the offices of the Times Herald newspaper in Norristown, Pennsylvania. According to the editors at the meeting, Toomey clarified his comment, saying he meant to say Republicans in general, not just his GOP colleagues in the Senate. 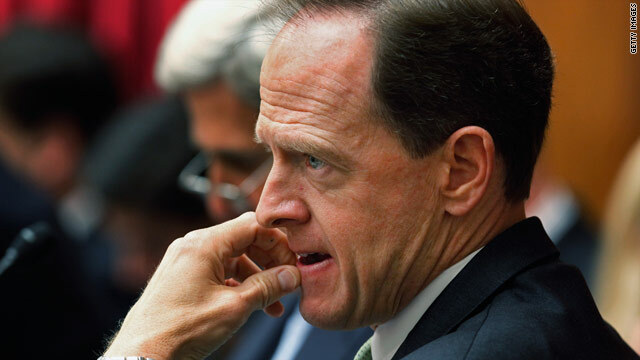 Toomey was one of four Republicans who voted on a measure to expand the background check system so that it covers private sales at gun shows and online. Five Democrats voted against the proposal (including Senate Majority Leader Harry Reid, who voted no so he could bring the bill back up later). In a 54-46 vote, the measure failed to reach the 60 votes needed to move forward in the Senate. Along with the background checks legislation, a ban on assault weapons also went down in defeat. President Barack Obama said Tuesday in a news conference that he suspected there were Republican members in Congress who vote against their instincts for political purposes. "Their base thinks that compromise with me is somehow a betrayal. They're worried about primaries. And I understand all that. And we're going to try to do everything we can to create a permission structure for them to be able to do what's going to be best for the country," he said. "But it's going to take some time." The president and gun control advocates chided lawmakers for failing to pass the proposal, the only one that had a real shot of passing among the slew of gun proposals brought forward in the wake of the elementary school massacre in Newtown, Connecticut. While Obama, Reid and gun control groups have vowed to keep up the pressure and bring the legislation back for a vote down the road, Toomey expressed doubt that a second vote will happen soon. "Reid could bring it up for a vote at any time, but we need five people to change their minds," Toomey said. "It's a pretty heavy lift to get five senators to change their mind on a big issue like this," he added. "It's not likely to happen any time soon. I hope people will reconsider over time." His comments sounded less enthusiastic compared with those made by Manchin. The senator from West Virginia said Sunday he believes the measure is still alive and together they can persuade enough lawmakers to support it. "I truly believe if we have time to sell the bill, and people read the bill," it will gain support, Manchin said. "I'm willing to go anywhere in this country, I'm going to debate anybody on this issue, read the bill and you tell me what you don't like." This lack of cooperation, even on bills that have overwhelming support, just to deny the president a legislative victory could not more clearly illustrate why the TEA Baggers need to be voted out of office in the next election. Pat its the gun laws is not going your way either, its no use fighting over the gun laws the people is getting them guns however they can. This problem with the gop can be solved at the ballot box!!!!!!!!!!!!!!!!!!!!!!!!!!!!!!! It sure will follow Senator Toomey home. This will hurt him in all PA counties except Philadelphia and Dauphin. They should have focused on improving mental health and left the gun registration schemes out. Did the GOP learn nothing during the last election cycle? Americans are tired of "politics as usual" and the constant obstructionism. Do those that vote against the POTUS constantly not understand that it is the people of the country that they are supposed to work for and not an small extremist group of elitists? Hopefully, their constituents will bear this in mind the next time the Ultra Maroons come up for re-election. Is this supposed to be a surprise.....or some kind of secret ? He only admitted the problem with the GOP and it's obstruction...and why they got walloped this past election. Americans know what the GOP is doing and most of them don't like it. They will evolve or perish. Quite often, the people doing the most harm still believe they're doing the right thing. Sometimes they even know it, but they still do it because they think their evil is the lesser compared to that of their political "enemies." As long as partisanship is more important to Republicans than the future of America, they will impede progress that would help everyone, in favor of that which helps just conservatives. Do you think tea party republicans will do anything on any day on any topic to help in any way? What I don't like about the bill is it is absolutely pointless. It won't do a single thing to address violent crime and even the authors know it. Why continue? Why spend money implementing and "enforcing" (lol) a law that for all intents and purposes, already exists? It's just silly. If Toomey is correct, and our Congress votes on bills simply to prevent another from succeeding, our democracy is a failed one. The way a democracy is suppose to work is that elected representatives vote on measures based on the premise of "promoting the general welfare". In my eyes, we the electors are to blame for the partisanship in Congress, and our elected officials have no backbone to stand up and vote for the common good. We are in avery sorry state. America stagnates while the rest of the world moves on. Republicans, willing to sink the country just to get to Obama. "There were some on my side who did not want to be seen helping the president do something he wanted to get done, just because the president wanted to do it," Toomey said. This is the direct result of the stupid two-party system which we are laboring under. Two teams. Just like a sporting event. And all the team lemmings cheer them on. why is this news! everyone and their mother knows this is why the repubs have been obstructing every rational solution this president brings forward to fix this country that the repubs oblitorate. they will go down big if they didn't make this country crash again. they have no political interest of seeing this country come from the debt, because they will loose their leverage badly. their soul mission is to crash this country, so that the people will elect them back to fix it. the problem is their mission to destroy this country is getting more noticeable every day. i wonder how long they can keep this up, before the gullible wakes up out of their cool aide dreams. lesson folks from now on, if the repubs are against something it is more than likely its good for the country. It is very sad that the republican racist bigoted base would betray fellow Americans on gun control just because a black President proposed it. Just another nail in the GOP's coffin. In the voice of The Simpsons 'Nelson' "HA-HA"
Good Move. The only help he needs is impeachment. Well once again, it is Kindergarten in the Republican party, I am truly ashamed to be a registered Republican, and am seriously considering changing my party to Independent. I honestly do not understand why our Congress cannot do what the public wants them to do – This appears to be another 4 years of a do nothing Congress and they frankly should not be paid!!! If they were working for anyone else, they would be fired. If the republicans can't support anything that the country strongly supports then what good are they? It's almost treasoneous to oppose everything sim[ply because you don't like the guy in charge. What would happen if we ran everything like this?? Chaos of course! Most Americans are not upset that the gun legislation failed, according to a poll by The Washington Post and Pew Research Center. So, once again, the GOP proves that it is devoid of ideas, is nothing but an obstructionist party, and that it is willing to screw the American people if they believe that they can hurt Obama. In the next election, we need to throw out every single Republican that voted against this common-sense measure on background checks. These so-called representatives don't belong in Congress. Typical republicans. Hurt the country because you have the mentality of a child who doesn't get ice cream when he wants it. That's right... the GOP does not want to help Obama destroy America. The modern GOP = crash-n-burn. What a sad legacy for such a traditionally honored opportunity. "Grandpa, ...what did you do when you were a Congressperson?. Answer: "Absolutely nothing! I fought the President." How lame is that!? at least Toomey has the guts to admit it. It's no surprise to us as the general public. The GOP thinks we're idiots and can't really see what's going on.